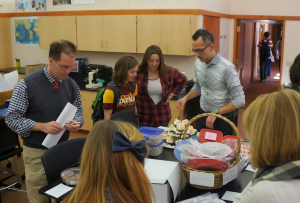 Delicious baked goods galore, hair styling services, a ‘break up’ gift basket, homework extensions and Valentine’s Day gifts were but a handful of items offered in this year’s student-run silent auction this week. Each year Prairie’s Upper School Service Club organizes a fundraiser to raise money for the Leukemia & Lymphoma Society. For the fourth year in a row, a silent auction was organized by students and bidding opened up on Thursday morning. Both students and faculty were invited to bid high and often in support of a wonderful cause. In the spirit of competition, high school advisory groups were asked to contribute at least one item to the auction. The item with the highest bid would entitle the winning advisory group to a catered lunch from the Olive Garden in support of their national “Pasta for Pennies” fundraising campaign. Schools around the nation raise dollars through this campaign and thousands of students work collaboratively to support the Leukemia & Lymphoma Society. The Prairie School is honored to be part of this national campaign. This year’s auction raised just over $1,000. Job well done! This entry was posted in All News, Community Outreach, Featured, Learn More About Prairie, Upper School by Communications Department. Bookmark the permalink.